Finding the right pillow can sometimes be quite the task. But it’s an important one. So much of our time is spent sleeping; so, considering the percentage of your life spent with your head on a pillow, you might as well have a comfortable one, right? Cooling Pillows are a great way to ensure a comfortable sleeping experience, which will, in turn, improve your overall health, both mentally and physically. It is hard to sleep well on a hot and sweaty pillow with little to no air flow. 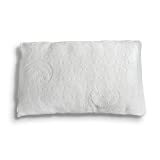 A cooling pillow can help ensure that you are well-rested. The better the time you spend asleep, the better the time you spend awake! We all have heard, at least once, that too little sleep can have negative effects on your health, but how exactly are you affected by poor sleep? While you are asleep, your brain is literally preparing itself for the next day. By doing this, it is getting ready to enhance creativity, help you pay better attention, help you learn better, and aid in decision-making the next day. Without good sleep, each of these things will be affected negatively. Studies have shown that people that don’t get quality sleep actually have trouble controlling their emotions and behaviors or coping with change. It is also linked to depression, suicide, and risky-oriented behavior. Not getting enough quality sleep makes people more tired throughout the day. As a result, their productivity level is lower, their reaction time is slower, and they have a higher rate of mistakes. All of these reasons answer the question: why should I invest in one of the best cooling pillows? Because these cooling pillows are specifically designed to help you sleep more comfortably and as a result, better. And better sleep can help to improve all of the above ailments! An investment in the right pillow can even be thought of as an investment in your personal health! Who Should Use a Cooling Pillow? Breathable: these pillows are crafted to enable air flow through the pillow and prevent warm air from building up within the pillow. Proper air flow promotes evaporation of moisture which results in a cooling effect. Water/Gel Pillows: these pillows cool your skin with conduction. Heat transfers from your body to the water or gel which will make your skin feel so much better. Whichever one you choose may depend on your personal sleeping style. For example, a bamboo, gel, or memory foam pillow might work better for you if you sleep on your back or side because of their thicker texture, while a breathable pillow might be better for you if you sleep on your back. The cooling pillow helps control your temperature, but it is important to get the proper type of pillow to fit your sleeping style as well. The best cooling pillows are the ones that encompass all three of these features AND can adjust to whoever uses them. Customizable and comfortable are key! Gel pillows are soft and cushy, but they have a memory foam base that offers more support than a standard down pillow would. Because they are made of gel and memory foam, these pillows don’t need to be adjusted to go back to their normal shape after having been slept on. They are also washing-machine safe, light, and hypoallergenic. However, although these pillows offer some support, it may not be quite enough for some people. They also are not super long-lasting as they can wear down or even start to smell. Bamboo is actually naturally hypoallergenic, so it is a great option for many. Bamboo fiber promotes airflow really well while also being firm and supportive. The standard bamboo pillow design is made with memory foam that shapes to fit you. Bamboo also has antimicrobial properties that will ward off unwanted bacteria and odors. However, brand new bamboo pillows are said to require some adjustments as they tend to smell like chemicals when you first buy them. In addition to that, they are a bit pricier than other pillow options. They also take a long time to dry after a wash, and they may start to smell musty. All of these brands have their advantages and disadvantages when it comes to being the best cooling pillow. Keep reading, and you will find our cooling pillow reviews to help you decide which one is the best for staying cool! This pillow is one-of-a-kind because it is filled with a memory foam, gel-coated polyester fiber with a cool comfort technology. It is expertly crafted to ensure the greatest comfort while you sleep, no matter what kind of sleeper you are—back, side, or stomach. While being both comfortable and plush, this pillow is designed for ease. Its no-shift design means that you can bend and fold it however you like, and it will return to its original shape on its own. You won’t have to spend time fluffing and readjusting your pillow throughout the night, and you can get better overall sleep. This brand of pillow also comes in packs of two, so you can either order for both you and a friend or even just get two pillows for yourself—bonus! Plus, you get to choose between either king size or queen size pillows. It is clear that this pillow was designed not just with quality in mind, but safety as well. The material used to make this gel pillow are chemical and allergen free and resistant to dust mites, mold, and mildew, so they are a great option for anyone dealing with respiratory issues such as allergies or asthma. The Sleep Restoration Gel Pillow can definitely be expected to last quite some time. Its luxurious materials are stain and fade resistant AND machine washable! The only downsides to this particular pillow are that, because it is so dense, it is heavier than a regular pillow. It is also made to be used without a cover which, for some, might be viewed as a drawback because you can easily remove a cover to wash. Instead, with this pillow, you have to wash the entire pillow. However, in this case, the good definitely outweighs the bad! This pillow is great for all you environmentalists out there. Both the materials used for the pillow AND the shipping materials are eco-friendly and high quality. The Kool-Flow micro-vented cover—made of 43% viscose of bamboo, 56.4% polyester, and 0.6% lycra—allows air circulation that diminishes body heat buildup. The cover is also zipper removable so it can be conveniently taken off for a quick wash. When ordering this pillow, you get to choose between either the standard size, the queen size, or the king size—and who doesn’t like options? There are absolutely no health risks involved in the use of this pillow, so you are guaranteed to sleep soundly, comfortably, and without worry. The foam is hypoallergenic as well as lead, phthalate, and ozone free. This pillow is filled with shredded memory foam that is luxurious, soft, and will immediately fit right to you for maximum comfort—with almost no adjustment period. It’s airy, breathable design ensures that you won’t have to worry about it going flat while you are sleeping on it. The Snuggle-Pedic pillow’s conforming shape can help to relieve back and neck pain and is also great for use during pregnancy. The Snuggle-Pedic brand is especially unique in comparison to other pillow brands because, if you get your pillow and it seems to have too much or not enough filling, you can actually send it back and the company will readjust it and return it to you right away—pretty cool! Because it is adjustable, this pillow can be a great option for literally anyone, no matter what kind of sleeper you might be! This pillow falls a little bit short on the versatility scale. At just 2.5 inches thick, the Bluewave Bedding Memory Foam Pillow is ultra-thin, meaning it might be a bit more suitable for those that sleep on their stomach or back as opposed to those that sleep on their stomach. This pillow does make up for its smaller target group, however, with the rest of its design. It is specially made to feature a dual sleeping surface, meaning that it is rounded on one side and flat on the other. That way the sleeper gets to decide which is more comfortable for them specifically. Its 50D, CertiPUR-US certified memory foam is infused with a temperature regulating gel to keep you cool while you sleep—since standard memory foam isn’t very breathable and can get quite warm. Plus, the materials used are hypoallergenic as well as lead, mercury, and heavy metal free meaning the VOC emission rate is very low—so less unpleasant memory foam odor! The Bluewave Bedding Memory Foam Pillow comes equipped with a premium bamboo cover. This material is cooler than cotton, wards off unwanted odors, and naturally, gets rid of moisture. It is also removable and washable for the user’s convenience and ease. Because of its minimal thickness, this pillow can help give relief for anyone struggling with neck or shoulder pain. If the head is not propped up very high while you are asleep, the spine can slowly start to realign itself. If you are not one to sleep well using super cushiony pillows, then this one is a great option! Nothing quite compares to the feel of a delicately fluffy, perfectly cushiony down pillow. 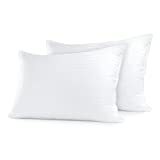 Down pillows pose a problem for those with allergies, though, because they are not hypoallergenic. The Blissful Serenity Bamboo Alternative Down Pillow takes all the cushy comfort of a down pillow and adds a couple more, great features. This pillow is the perfect blend of soft and firm. Plus, its affordability is also a huge bonus! Crafted with hypoallergenic materials, this pillow comes with a removable bamboo cover that can be easily taken off and cleaned—either by hand or in the washing machine—as often as you wish. The pillow itself can also be thrown in the washing machine if need be. The Blissful Serenity Bamboo Alternative Down Pillow is made You can also get this pillow in both queen and king sizes—whichever suits you better. Although typically recommended for back and stomach sleepers, its fluffiness and softness mean it can also be just as suitable for side sleepers, assuming that particular side sleeper likes big, soft pillows. But let’s be honest, who doesn’t? It is also totally customizable! You can actually unzip the cover and take out as much of the polyfill as you wish, so this pillow really can be an awesome, affordable option for just about anyone! However, if you are one of those who do prefer a firmer pillow, then this probably isn’t the right one for you. This gel-infused, memory foam pillow by Coop Home Goods—also known as the Eden Pillow—is perfect for just about anyone, but especially great for those that sleep better with significant head and neck support. At a totally affordable price, this pillow features a gusseted design that prevents the filling from shifting around while you sleep—also known as pillow pinch— so your pillow maintains a more even surface throughout the night. The outer cover encases soft, conforming memory foam that is inventively cut into pieces to promote better air flow. This pillow also features Ultra-Tech fabric—40% bamboo-derived viscose rayon and 60% polyester—that works together with the cooling gel to create a comfortable and breathable pillow. You can also unzip the cover and pull filling out in order to adjust the pillow to your preferred thickness. Also designed to be soft, supportive, AND safe, a huge factor that plays into pillow purchases. This pillow is hypoallergenic, dust mite resistant, and contains NO flame retardants. Additionally, it’s made for overall user convenience as both the cover and the pillow is machine washable. This cooling pillow is a great one for those that like the feel of memory foam, but even though the memory foam is cut into smaller pieces, it feels about the same as standard memory foam. So, if you don’t dig the conforming material, this may not be the right cooling pillow for you. So, which one of these “cool pillows”—pun intended—is the best? The Snuggle-Pedic Bamboo Shredded Memory Foam Pillow. So, it seems pretty clear that although the other pillows are great, this one is the most versatile and usable. It really is the coolest pillow!